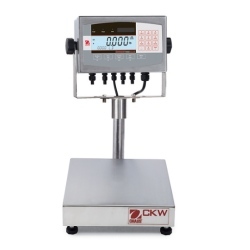 CKW Series of bench scales are dedicated checkweighing scales built for applications requiring fast and accurate operation. Designed with the operator in mind, the Ohaus CKW scales are easy to operate, but allow full configuration to match different over/under check weighing procedures. Food-safety design. Combining an NSF-certified and USDA accepted food-safe base, durable stainless steel construction, and industry leading software, the OHAUS CKW Series includes fully-dedicated checkweighing scales built for applications requiring fast and accurate operation. The OHAUS Defender Series now includes a new CKW Checkweigher option, using the popular T71XW indicator and featuring the same options as our Defender 7000. The newest CKW models from OHAUS replace the previous CKW55 models, and feature an increased memory of 128 SKUs, NEMA 4X/IP66 protection, a dual-line backlit display, and full alphanumeric keypad. With a 9" column and an NSF-listed base that also supports HACCP systems, the OHAUS CKW Series has more options than ever! Easy access communication port including RS232 (included) and second RS232 or RS422/RS485 (sold separately as an accessory.) GLP/GMP data output with Real-Time Clock.